What do you do at Yale? 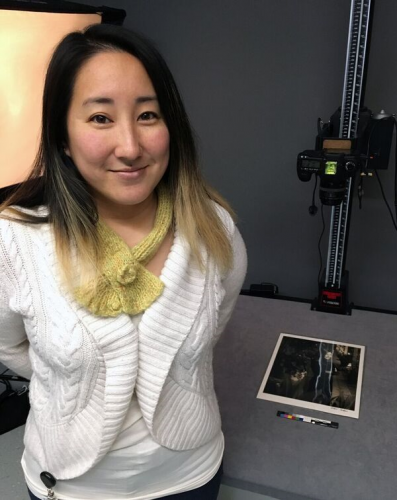 I work at the Center for Preservation and Conservation at Yale University Library as a conservation technician - focusing on paper and photographs. What surprised you about joining the Yale workforce or moving to New Haven? The pizza culture, I had no idea! Mashed potato pizza is my favorite. How did you get to your role in the library? My career took a winding path through the arts and education, and I moved from museums to research libraries. For me a career in book and paper conservation combined my interests in art, history, science, and craftsmanship into one. How does art connect you with people? Why did you decide to get an MFA? I sought a program where I would learn from masters in the fields of bookbinding, papermaking, and letterpress printing, and have access to incredible printing presses. A studio practice in book arts and printmaking gave me knowledge I use in my bench work addressing condition issues of items from Yale’s library collections. Doing conservation work gives me a sense of purpose; I am participating in the preservation, longevity, and access to information. In this way, yes, I feel connected to others in the shared civic responsibility to uphold resources such as libraries. I love cooking. It is one of the first things people learn about me. I enjoy washoku - which is the Japanese sensibility of simply prepared foods that reflect the seasons. My kaki (persimmons) are air-drying in the sun and will be ready to eat this spring. Currently it’s all about mochi making for the new year. How do you approach diversity, inclusion, and equity development in the workplace? I start with myself and persevere. Listening and being curious, are key ingredients I use in the workplace to bring about inclusiveness and creative thinking. I respect and rely on my colleagues because we have varied backgrounds, educations, and perspectives. It is what makes my department strong when embracing cultural heritage in both the analog and digital worlds. What excites you as a new steering committee member of the Asian Network at Yale? ANY was very welcoming and made me feel a part of the Yale landscape. I attended some amazing lectures last year, some in cooperation with other affinity groups, which motivated me to pitch in and contribute. My fellow steering committee members represent a vast array of professionals on campus so it’s a good way for me to learn more about this place and see what can come of our combined talents. I don’t have a favorite genre per se, rather I like reading books upon friend recommendations because I like discussing what we’ve read as much as reading itself. My nephew wants me to read Harry Potter, starting from book one, he’s already on book five.